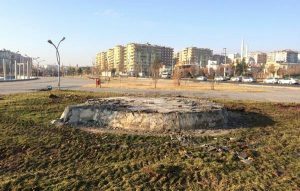 A monument erected in a public square in the southeastern province of Diyarbakır has been removed by an order from a trustee who was recently appointed by the government to replace the democratically elected mayor of Diyarbakır’s Kayapınar district. Former Kayapınar district governor Mustafa Kılıç was appointed as a trustee to the Kayapınar Municipality following the arrest of Kayapınar Co-mayor Mehmet Ali Aydın on Dec. 7. Aydın is from the ranks of the pro-Kurdish Democratic Regions Party (DBP). Thirty-four young Kurdish civilians, all male, were killed in December, 2011 when Turkish Armed Forces (TSK) jets bombed them after they were mistaken for terrorists of the Kurdistan Workers’ Party (PKK). The incident took place near the Uludere district of the southeastern province of Şırnak on the Turkish-Iraqi border. The civilians were from low-income families in Şırnak who relied on the smuggling of oil and goods from Iraq to make a living. 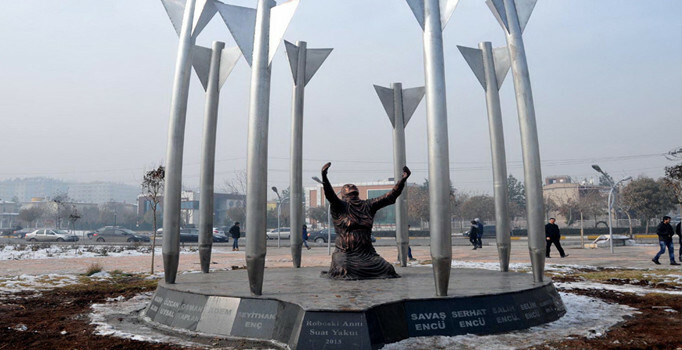 In 2013 the Kayapınar Municipality erected a “Roboski Monument” in Diyarbakır’s Rojava Park in memory of the victims of the Uludere tragedy. Roboski is the Kurdish name for Uludere. However, the monument was removed on Saturday night by police officers upon an order from trustee Kılıç. The monument used to feature the statue of a mother weeping for her sons killed in Uludere surrounded by eight rockets. The names of the 34 civilians killed in the attack also appeared on the monument. Turkey has stepped up its crackdown on Kurdish politicians in recent months. Trustees have been appointed to dozens of municipalities in the country’s predominantly Kurdish Southeast, while Turkish courts in November arrested 10 pro-Kurdish Peoples’ Democratic Party (HDP) deputies including the party’s co-chairs. Two more HDP deputies were also arrested in early December, bringing the total number of HDP deputies under arrest to 12. One of the HDP deputies arrested in December was released in early January. There are currently 11 HDP deputies behind bars. Turkey has also arrested dozens of local Kurdish politicians on terrorism charges. This article originally appeared in Turkish Minute on Jan. 8.